Want something everyone can enjoy? Fun for all ages ! Lasertag New Jersey can take your Bar/Bat mitzvah event to the next level. Lasertag ia a unique turn-key activity that everyone will love. We will rotate new players in so that everyone can play. Lasertag is a safe game that everyone can play kids and adults too. We will work with you to make your special event memorable. Lasertag New Jersey is 100% mobile. We will come to the site of your party and set up an outdoor arena where you and your group can play. We can also setup at indoor venues if they have another unused room available. Since Lasertag New Jersey programs are portable we can also travel practically anywhere – sports fields, ballrooms, parks, parking lots or gymnasiums. Our staff will setup the field and facilitate the games. All you have to do is bring your guests. 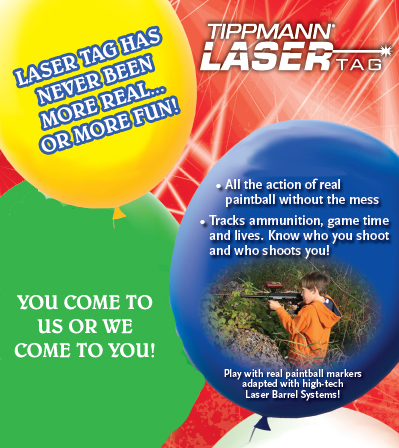 Call now to add Lasertag New Jersey to your special event!